Dounreay recently presented three talented local children with prizes that were awarded for drawing competitions and a junior quiz, all of which were held throughout the 2002 season in the Dounreay Visitor Centre. There were also three other winners from various parts of the UK who received their prizes through the post. 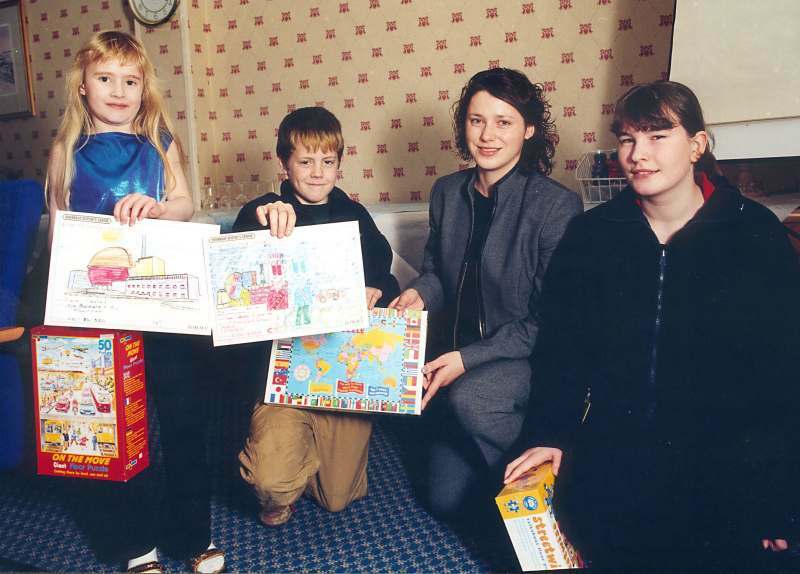 Fiona Gunn, Secretary to the Dounreay Director, joined the winning children for the presentations and is pictured (from left) with Sharon Mackay aged 6, James Halliday aged 11, and Amanda Burns aged 14, who are proudly showing off their prizes and drawings. Tina Wrighton, who manages the Dounreay Visitor Centre, explained 'we had a huge number of entries in all three categories and it was a very difficult decision to pick out winners as so many of them had given us the correct answers and such wonderful pictures. Amanda, James and Sharon did very well and it was a pleasure to reward them for their hard work'. The visitor centre opens again in May this year, is free of charge and can be enjoyed by the whole family, children of all ages are most welcome and can enjoy the variety of books, toys and competitions.